Everyone should try something new and different once in awhile. 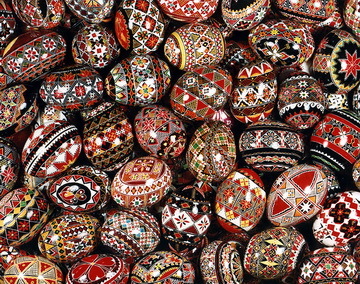 I have always loved the Ukarainian eggs (http://en.wikipedia.org/wiki/Pysanka) since I first saw them in the 70’s and have collected three or four over the years. I have collected books and magazine articles about them and have always wanted to take a class. Last January when we toured the Strawberry Hill Museum ( http://www.strawberryhillmuseum.org/ ) I learned they offer a class in the spring. I signed up and yesterday was the day. My egg was a simple design, but my stars are a bit off and I noticed some places where I did not get the wax applied well and the wrong dye is peaking through. But all in all I was pretty pleased with my first attempt. It is complete I just have to varnish and then decide whether I am going to blow my egg or take a chance and let it dry up. I would love to get into a group that meets once a month for a couple hours. I bought a kit and I think I will order a couple more Kistka’s (pens used to apply wax). These come is different sizes and my kit came with a med point but think I would like a fine and broad also. 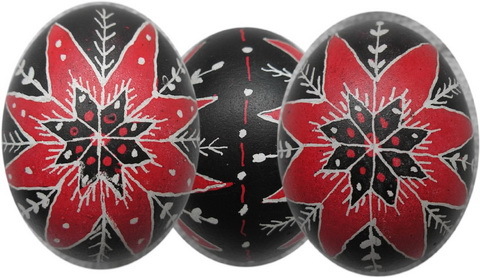 Gong to have to spend some time looking up information on Pysanka (Ukrainian eggs) on the internet. But right now I need to get back to my Easter project I have already started for this year…especially if I expect to have finished by Easter.